This carefully restored 17c farmhouse is a textbook example of the Quercynoix style - pigeonnier, covered balcony, souillarde, two inglenook fireplaces. Superbly situated in a hilltop hamlet, perched above a charming working village, its generous accommodation could suit two big families. Extensive grounds include a safe private 10m pool in its own attractive stone walled garden with two secure gates. There is also a large flat grassy area for games, a shady raised terrace for dining and a barbecue. Facilities; washing machine room, three bathrooms, well equipped kitchen (dishwasher, microwave), wood burning stove. for those with young children, there is a bespoke wooden stairgate, two cots and a high chair. The area boasts magnificent unspoilt scenery, fine regional architecture and affordable gastronomy. 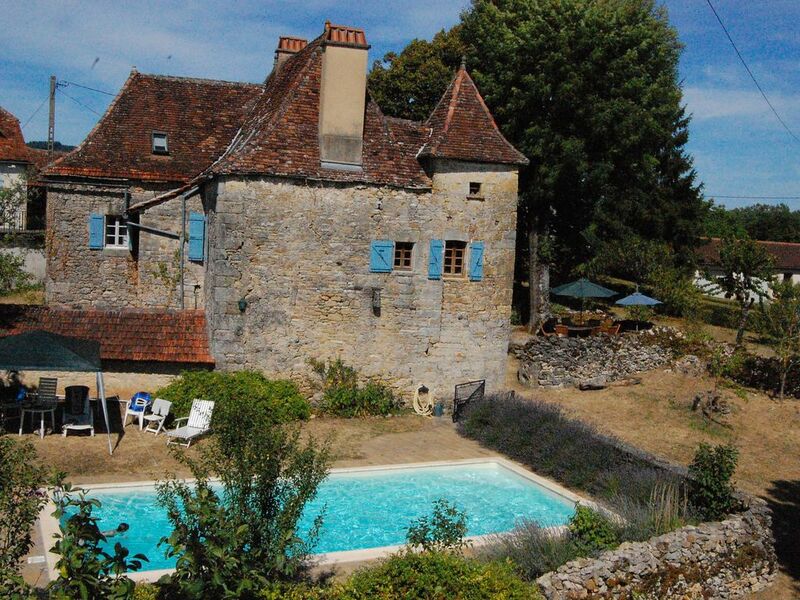 The property was selected for the Alastair Sawday 'Special Places to Stay in France' guide. There is a diverse range of attractions in the locality - a zoo, a monkey park, 'Reptiland' and an increasing number of low impact 'green tourism' activities, such as canoeing, which makes this an ideal base for families with children of all ages. History: This majestic farmhouse dates from the late 17th century. Its ancient architectural features of pagoda-like roof, pigeonnier tower, bolet covered balcony and souillarde stone vaulted area evoke an atmosphere of past centuries in this most beautiful and historic region of rural France. Standing high above a village in a hamlet of five dwellings, the house has been carefully restored over the last decade and a half by skilled local masons and carpenters. It is described locally as a Maison Bourgeoise due to its grand appearance and size. Location: The peaceful hilltop location affords lovely views to open countryside and across a charming village roofscape with church and chateau bellow. The extensive grounds include an enclosed private pool, mature trees, shady terraces and a large, flat paddock, ideal for garden games. This rambling farmhouse provides comfortable accommodation for large parties that might include several families. Cuisine and activities: The region is renowned both for its gastronomy (spicy, full-bodied Cahors, confits, foie gras, fragrant cepe wild mushrooms) and for offering cultural and leisure opportunities to suit all tastes, historic towns with regular markets, unspoilt villages, chateaux and museums, canoeing, biking and horse-riding together with numerous prehistoric caves to explore. A charming, qualified English-speaking babysitter enables guests to enjoy evening entertainment at local festivals (jazz and classical music at Assier, St Cere, Rocamadour) or simply to sample the cuisine at one of the excellent local restaurants. Alternatively the evening might be spent with a barbecue on the raised terrace overlooking the floodlit pool! Michael and Clova Stinton fell in love with this lovely old house whilst on honeymoon nearby in August 1988. The folly of such a rash purchase has become a joyful element in their marriage and they have enjoyed returning regularly as their children, now 28, 27 and 20 have grown up, making many good friends, including their near neighbours, Marie-Hélène and Jean-Marie. As creative people and school teachers (musician and artist, respectively) the long holidays have given the family the experience of a rural idyll away from the city environment of Oxford, where they live. Renovating the house, using craftsmen from the village and nearby, has been a special source of satisfaction and many guests have commented on the tasteful way that the house has been restored, using local materials and respecting the rustic character of the house. This large, safe and family-friendly farmhouse is ideal for large parties of up to thirteen plus two babies, and, in the past, three generations of the same family have regularly taken the house for holidays. Whilst it serves as a great base for those wishing to explore, it is also a safe haven to enjoy, just staying by the pool and relaxing in the sun. The house is situated in an unusually unspoilt village location, with lovely views from the house and good walks in all directions. The building, too, preserves the integrity of its original rustic architecture and all its local features, such as walk-in fireplaces, together with citerne, souillarde and bolet. The grand pigeonnier (now housing all three bathrooms) and stone staircase are all original and intact. There are many activities nearby, as well as a lovely, very safe private pool that guests can enjoy. A good number of classical music CDs are available for clients to use - or they can bring their own. Canoes and Kayaks can be hired at both Beaulieu and Gluges on the river Dordogne. The hire includes being returned to the starting point by minibus. A large terrace underneath a large ash tree can accommodate tables with up to 14 seated and a barbecue right next to it on a flat level stone base. *The six children's beds are comfortable metal dormitory beds located in a large, airy dormitory space. *The family bedroom is located behind a large, heavy curtain (see our web site for bedroom plan). *Serious cyclists should bring or hire their own bicycles *Wood for heating is available for spring and autumn lets. A wonderful week spent with family in this gite. The house is full of character and the pool area was spacious and great fun for the kids. The owner was very helpful and managed our expectations well. Would thoroughly recommend for large family groups. We are delighted that this large group enjoyed their visit to Maison Lafeuille. They proved to be ideal tenants - friendly, positive and appreciative of the history and ancient charm of the house. They are welcome to come again! Ideal place for a holidays with a large family! This property is ideal for a holidays with a large family or group of friends. The place is clean and well-maintained and is also very authentic. The house is very well equipped, probably just missing an internet connection (though we actually enjoyed in the end having no internet). The pool is safe and very beautiful. The region offers plenty of activities and attractions (Rocamadour, Gouffre de Padirac, Sarlat, la Dordogne, etc). The owner has been very kind and helpful and easy to communicate with. We recommend it to a friend or a relative. We would like to thank Adeline for her comments. Up to 2014 we did not offer internet access from the house (having tried to resist it for years, as this is a place to escape from the digital world!) - but from 2015 we have now installed a fast and powerful wifi connection to allow guests to access the internet. We had a wonderful time in Maison Lafeuille. Great house, with many rooms, plenty of services. The swimming pool was perfect. Located in a small typical south french village. Not far from Lacapelle, which has restaurants, grocery, and a nice small market every morning. Highly recommanded ! We are delighted that this review aptly sums up our house, Maison Lafeuille. This family group was a large one and we are particularly pleased that they enjoyed the pool, which was recently upgraded to a very high standard. The house itself has an appealingly solid, antique and rustic feel, balanced by a modern kitchen with several charming eating spaces (outdoors, under a roof, and indoors) and a beautiful pool with a lovely patio for sitting and reading and looking out at the trees. The house's location made it an excellent base for exploring charming old towns and cities like Figeac, Rocamadour, and Cahors by car, and staring out at the marvelous pastoral landscapes of Lot and Dordogne. But on days with pleasant weather, we most enjoyed setting out walking one way or another right from the house on the nearby GR 10 footpath, which winds over meadows and through woods before dipping into small villages. The fields, orchards, woods, and meadows surrounding the house are lively with birds, and over a few days we spotted over 30 species of birds on our walks from the house. We loved walking at all times of day, on the paths and down the quiet roads nearby, with marvelously pastoral views across rolling hills. Similarly, we loved hiring canoes on the Dordogne, not far away, to paddle through forest and gaze up at cliffs and quiet villages among them. I would be eager to return to the house for more relaxing and walking. Peace and tranquillity guaranteed, two excellent master bedrooms and room for many children - who have a safe enclosed garden for play and a lovely pool. Very good dinning out - canard the local speciality - a short drive away. If your party includes keen cooks (as ours did) then you will immediately realise that the excellently equipped kitchen belongs to people who care about cooking. Depending on your mood, and the weather, there are four eating areas. Birdwatchers need not leave the garden and walking and hiking start virtually at the front door. There is a piano, a good music system and very comfortable chairs for relaxing indoors, and plenty of chairs and shady spots for relaxing outdoors. History in abundance is a short drive in any direction with Rocmadour a quite breath taking jewel in any crown. There is boule in the garden, tennis in the next village and stunning canoeing on the Dordogne just a short drive north. If you need to stay in touch then bring your own dongle and there is excellent internet reception. There are books but no TV. Even the local French neighbours are absolutely charming. What else does a family holiday need? (which we didn’t) we were able to contact the owners. Maison Lafeuille is located in a village 15 minutes south of St. Cere, roughly equidistant from the Lot and Dordogne rivers. Rueyres is on the edge of a National Park (Parc Naturel Regional des Causses du Quercy). It is immediately surrounded by attractive hilly, wooded, farm land, but very close to the wild and characterful plateau of the Gramat Causse and near the majestic valleys of the Dordogne and the Lot ( the latter with the additional attraction of fine vineyards). Rodez Airport (Ryanair) is just over an hour away and the new airport, south of Brive-la- Gaillarde, is 45 minutes away. A subsidiary of Air France operates a regular service from London City Airport. Other Activities: historic buildings, bird watching, gastronomy, markets. Canoeing on the nearby Dordogne is a must, as well as a visit to the nearby cave paintings of Peche-Merle and a boat ride on the underground river at the Gouffre de Padirac. Golf: Golf is available at nearby Montal adjacent to its famous Renaissance chateau just before St Cere, about fifteen minutes to the north. MAISON LAFEUILLE WEBSITE For further information please request our web site address by telephoning us or by email Deposit: This is €150 and payable with the second 50%, 60 days before check-in.